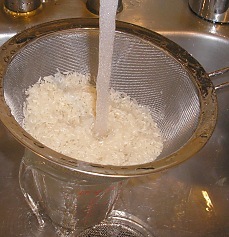 Thoroughly rinse rice before cooking, in a mesh strainer in the sink for at least three minutes in cold water. This washes out the starch and when the rice is finished cooking it is not sticky. Place strainer on top of large measuring cup. When water runs clear, (from milky colored) the starch is removed. For every amount of rice simply double the water. Boil the water. Add salt and/or other spices. Add rice. As soon as rice comes to a boil, turn burner down to simmer/low. Put lid on. Try not to open during this time. Set timer for 15 to 20 minutes. (Time depends on your stove. Mine cooks rice in 20 minutes on low simmer on my electric stove.) Check rice after timer goes off. Stir. If too dry, add more water. If too wet, cook for five more minutes. Let sit with heat off to finish. Store dry rice in a moisture proof, air tight container. It will keep fresher longer, prevent bacteria, cabinet moths, etc. Making "Simple Syrup" is so easy. It's 2 parts sugar to 1 part water. Example: 1 cup sugar to 1/2 cup of water. In a small sauce pan, bring water to a boil. Add sugar, stirring, bring to a boil, turn off heat, let cool, store in a jar in the refrigertor. Now go press your Staples EASY button. What to do with simple syrup? Use the sweet syrup for ice tea to eliminate sugar crystals on the bottom the glass. Great for hot tea, too. And... and before I forget... Mojitos! I love using fresh ground Sea Salt. It's sold in all grocery stores in the spice section and tastes much better than regular old table salt. Sea Salt has a rather pure salt taste, the regular granulated kind of salt will taste bitter after you've become accustomed to Sea Salt and best of all there's no additives. Simply put the salt it in a clean pepper grinder. Try it, you'll like it! Put a slightly damp towel underneath your plastic cutting board to keep it from moving around when you're cutting veggies or pounding meat. My Grandmother was right.... Cleanliness is next to Godliness! I keep Clorox Clean Up and Windex nearby on the sink and use them several times a day to wipe the sink and counters to prevent food born illnesses. Use paper towels to clean really grody, germy messes. Use a clean new cloth kitchen towel every single day as the towel you used yesterday has millions of germs and bacteria embedded in it. After dinner throw that used towel in the laundry room. Important lecture and 100% true!!! You should never put purses or back packs on a kitchen counter or a dining room table as you do not know where the bottoms of those objects has been. There's been scientific testing that conclusively shows these objects having deadly bacteria on them, such as E Coli and Hepatitis. For instance: A man steps in dog crap, gets in his car and goes to the local subway or train station. You set your purse or backpack down where he was standing... but you had no idea... The bottom line is that you never know what has happened in public areas on the ground. Even a clean looking public restroom can be dangerous. Look here at Google: I found 47,000 possible articles. Read an article about "Purse Germs" at SNOPES. I often wash my sponge on the top rack of the dish washer and replace it often. Good Buy: Get a large bag of sponges at Costco. Also from Costco, for years I've been using the jumbo sized restaurant quality plastic wrap (3000 feet) and aluminum foil (1000 ft). They last for at least a year (or more) in my house. Definitely a good value for the money, approximately $10 dollars each as opposed to $3.00 each for the smaller version grocery store products per month ! 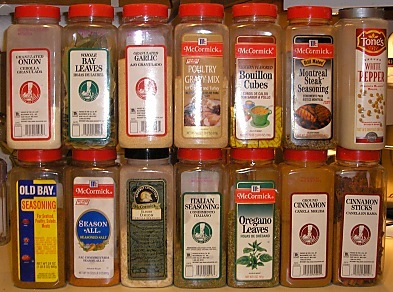 Buy frequently used spices at Costo (or Sam's) in large 16 oz sizes. When buying spices at the grocery store, a small jar of spice (2 to 3 oz) can cost the same as a large container at the Warehouses! I'm not kidding, check this out for yourself! I don't fry bacon, I BAKE it! It turns out perfectly crisp and perfectly formed every time and no grease splatters! Heat oven to 350 degrees. Use a baking sheet with a rack that fits the entire sheet. Lay aluminum foil on bottom of pan for easy clean up. One package of bacon just fits every last inch of the tray. Put in oven and bake for 30 minutes. Or bake at 450 and cook for 15 minutes but you have to watch it more, so it doesn't burn. Don't forget to use a timer. I use that half hour to do other things, preparing what ever else I am making. By the time the bacon is done, the family has curiously assembled... ;) Remove bacon from pan to paper towels with tongs or spatula to get rid of extra grease when done. If you wait too long, when the bacon is cold it will stick to the rack. Then the grease is cool, dispose over trash can by peeling the foil straight into the trash can. I like to use nonfat sour cream instead of milk or cream to make cream sauces and soups richer. I don't actually boil them, I cook them on a low simmer for about 12 minutes, then turn off heat and then let them sit for another 5 minutes. Perfect and not ever cracked, every time! My kitchen tip is to use a very sharp knife when cutting vegetables and meat. Dull knives are even more dangerous than sharp ones, because they are less dependable.